Yet another new project! I’ve had a little trouble trying to figure out what to blog about, since I have so many projects that are finally far enough along to write about. This week I had planned on posting the second installment of the Black and Grey dress, but I ended up being quite productive – I started, and finished this dress and felt the need to share it as soon as I could. This is one of those garments that has evolved a lot from what it was supposed to be. One of my future projects needs to be worn over a cream colored dress, most of the dress will be hidden, but the front of the bodice, skirt, and sleeves will all be visible. 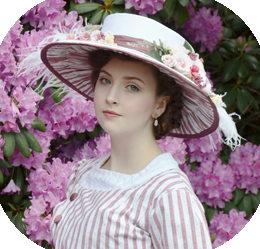 I had originally planned on making a fitted garment that had ruching at the front, elbow length sleeves, and a separate very full skirt. But I soon realized that was way more complicated then it needed to be, instead I could make a chemise like dress which would give the same effect but be easier to make and more versatile. Then I realized that if I was aiming for versatility, making the garment have long sleeves would be a much better idea. On left you can see the original idea, and on the right you can see what it turned into. So all that being said, i’m not quire sure what to call this garment. It’s basically a chemise that is worn over the stays instead of under it. Like a shorter, shapeless, long sleeve version of chemise a la reine. Anyway – I’m going to break this project up into two posts. This part will talk about the collar and bodice, and part two will talk about the skirt and sleeves! Step one was fabric selection. 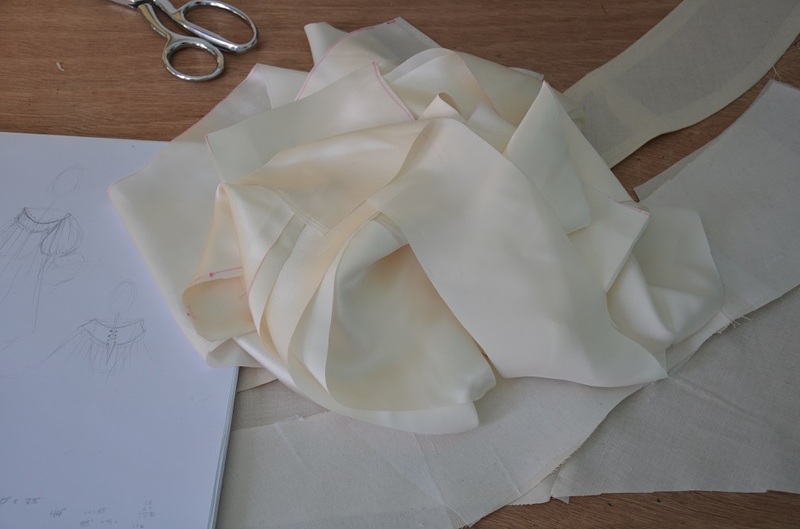 I had seven yards of champagne colored silk satin laying around that proved to be perfect for this project. 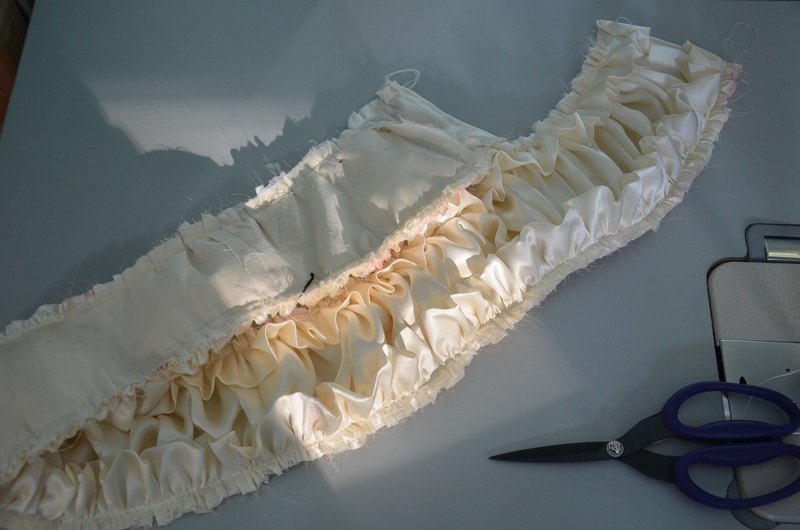 Other then a bit of ivory thread, and muslin for lining, that was all I used to make this. 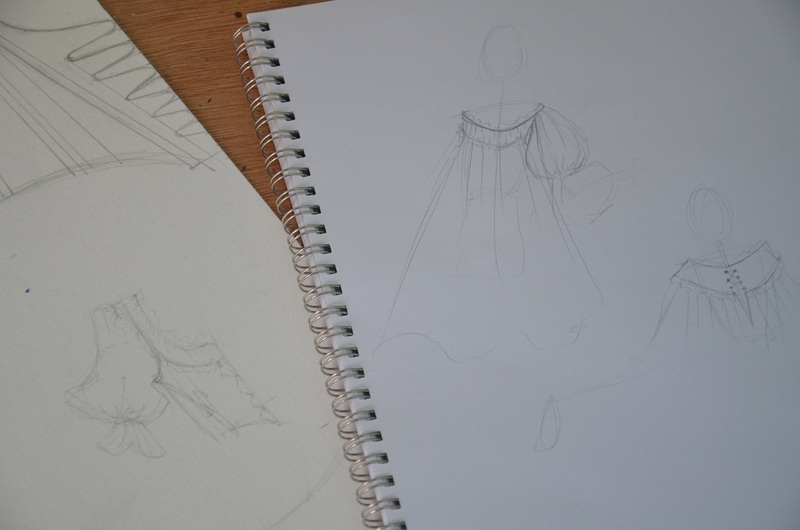 I started by drafting the bodice. This was quite simple since all I did was alter the pattern used for the stays I plan to wear underneath it. 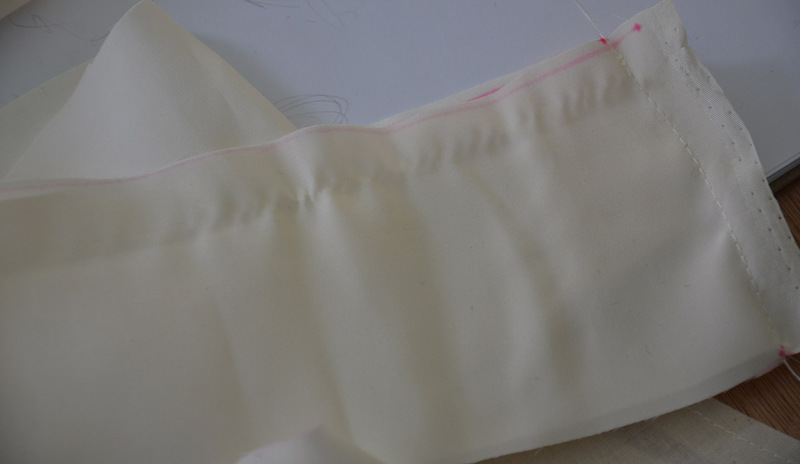 Then I drew on top of that pattern the shape I wanted for the collar and added seam allowances. Once I cut my patterns out I was left with this. I cut the pattern for my collar out twice. 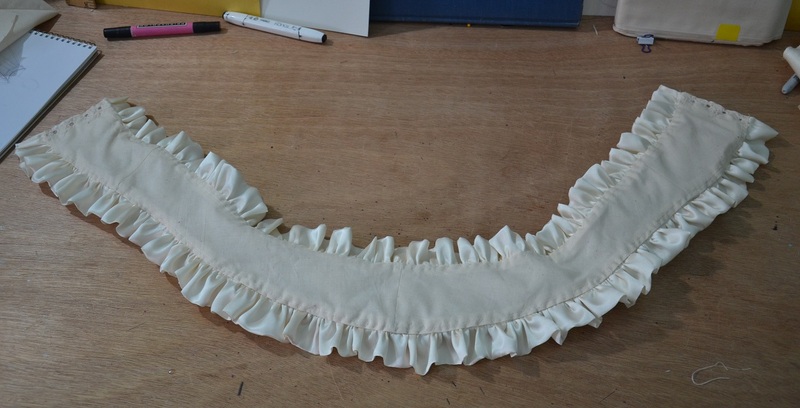 One for a base to sew ruffles onto, and another to use as lining. 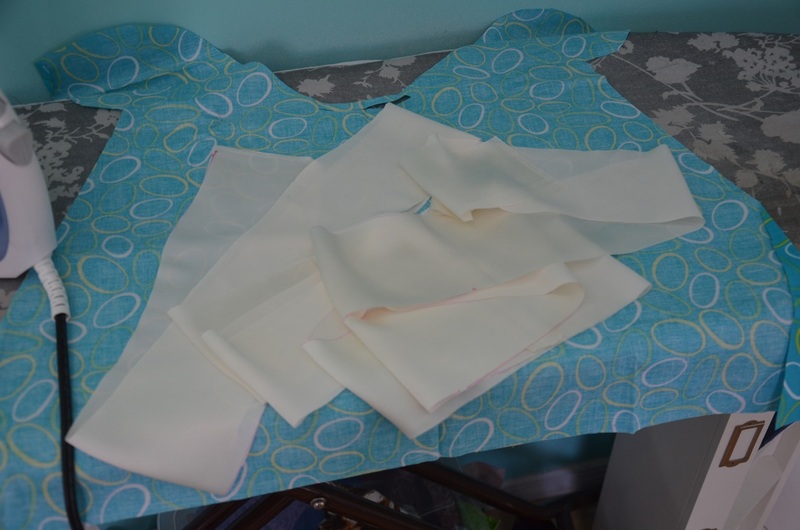 I used iron on interfacing to slightly stiffen the one for the base, this way it would be less likely to pucker when I was gathering things over it. For the one I planned on using as lining I folded the edges over and sewed them in place. 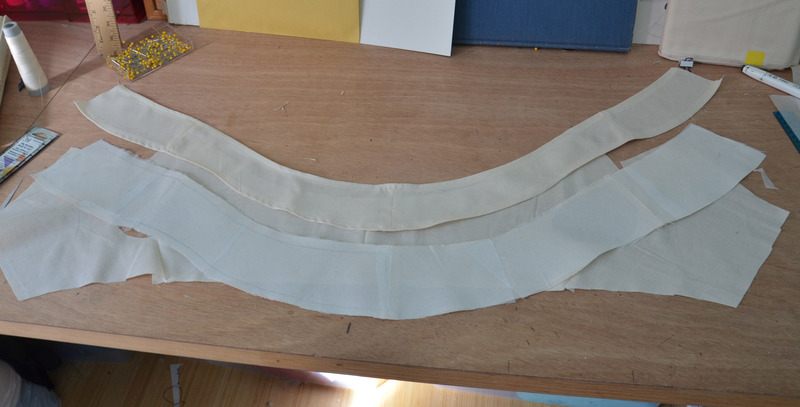 I also took a minute to finish the edges of the bodice lining. The bottom edge has a rolled hem, and the top edge is just folded over once. 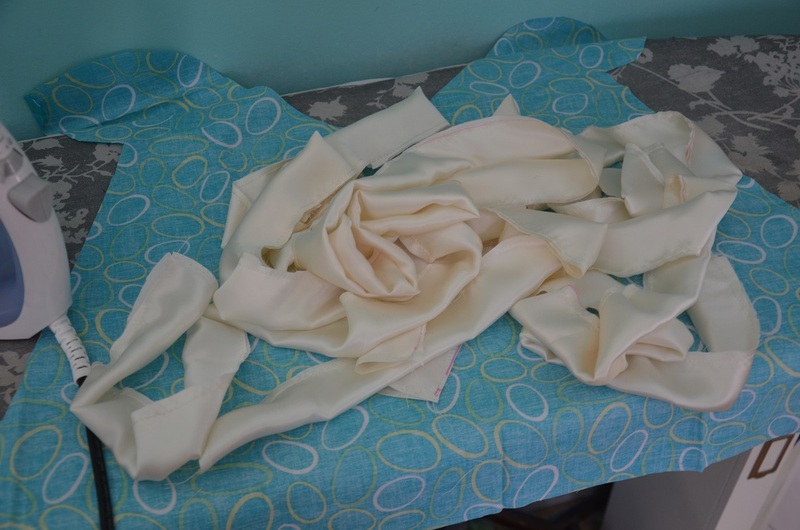 Then I was ready to move on to the fun part – making ruffles! 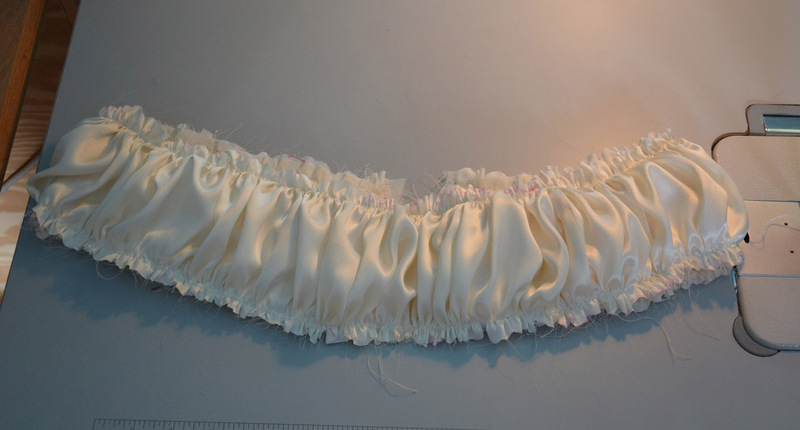 For the neck piece I cut three five and a half inch strips and six four inch strips from the silk satin. I sewed them together and pressed the seems open to make them look smooth. I folded the four inch strips in half and sewed across the tops. This part reminded me of how frustrating silk is to work with! Since it’s such a fine weave you have to change your needles very frequently, otherwise it can catch on the silk threads and create pulls and puckers. 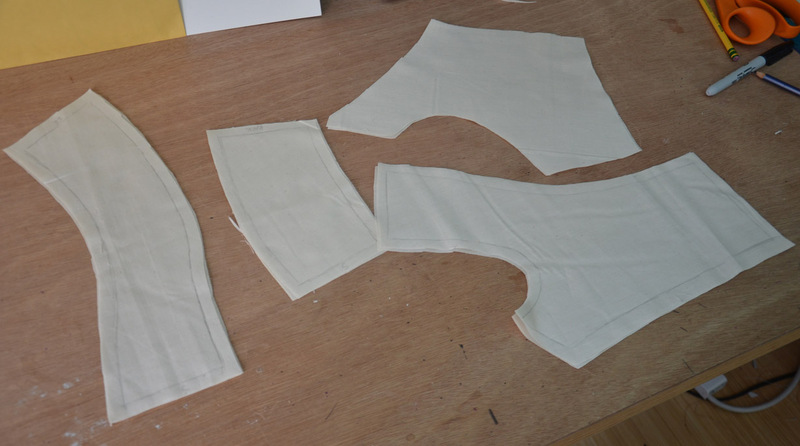 The folded strips were then ironed (luckily none of the pulls were too bad and they all pressed out!) and set aside for later use. 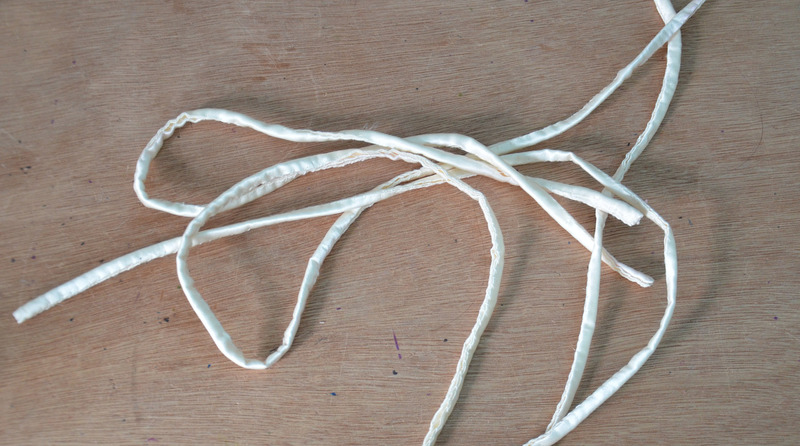 I moved on to the five inch strips, which were going to be gathered over the muslin base to create ruching. I placed a few pins on each side to make sure the gathers would be even, but I used the less precise gather-as-you-go method so they aren’t completely perfect. Once I was done with both sides it looked like this! 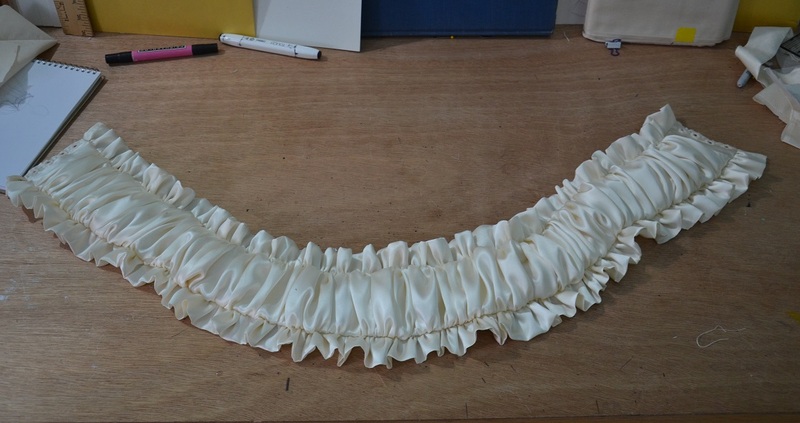 I picked up my four-inch-folded-to-be-two-inch strips and repeated the gather as I go method to turn them into ruffles. I should also mention that I cut little four inch by four inch squares of silk, which were reinforced with interfacing and then folded in half. 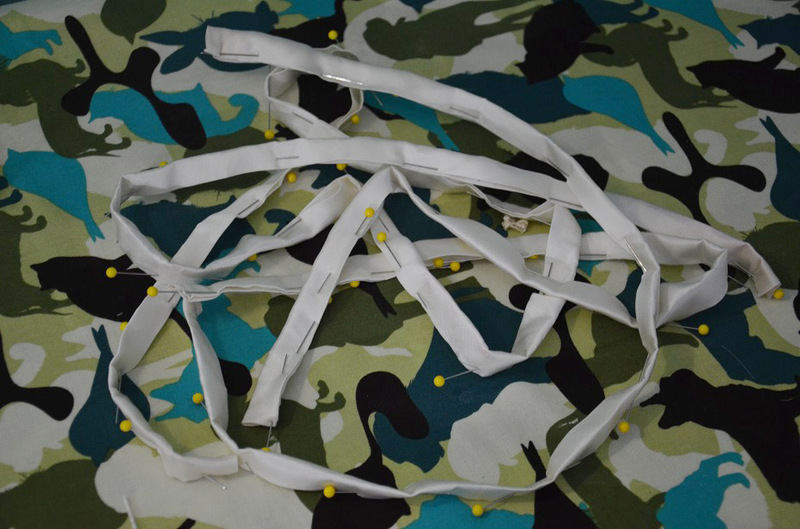 I sewed these onto each end of the collar so I would have a good foundation for sewing the eyelets. There were some pretty ugly raw edges going on which needed to be cleaned up or hidden in some way. This is where the lining I cut earlier came in handy. Once I had it pinned I went in and slip stitched it down. I also embroidered all the eyelets. I’ve learned that I don’t care for embroidering a lot of eyelets at once (say thirty) but I do like them in small doses. 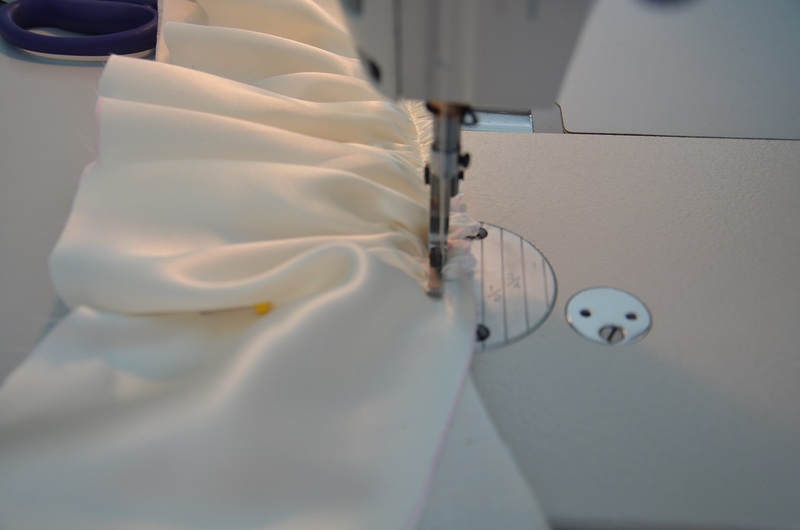 It’s weirdly satisfying poking holes in fabric and then making them look pretty. 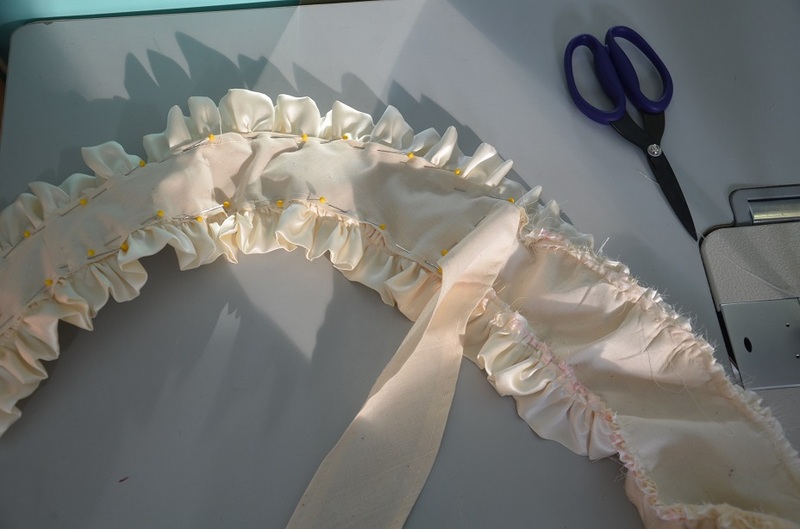 The final thing I did relating to the collar was creating lacing to go through the eyelets. I’ve looked online and the options aren’t very pretty or strong – and the ones that are, are also expensive. So I decided to make my own. I think I will do a proper tutorial for this on tumblr eventually – it’s really easy to do, but it’s hard to explain. I used inch and a half wide strips of fabric folded over so there weren’t any raw edges. Then I slip stitched them up the side. And that is everything for this post! The second and final installment in this “series” should be up tomorrow!